Tennessee Central Railway Special Officer #2 Badge. The Tennessee Central Railway was founded in 1884 as the Nashville and Knoxville Railroad by Alexander S. Crawford. It was an attempt to open up a rail route from the coal and minerals of East Tennessee to the markets of the midstate, a service which many businessmen felt was not being adequately provided by the existing railroad companies. They also wanted to ship coal and iron ore to the Northeastern US over the Cincinnati Southern Railway, which was leased to the Southern and operated as the Cincinnati, New Orleans and Texas Pacific Railway [CNOTP], through their Cincinnati gateway. The N&K was only completed between Lebanon, where it connected to a Nashville, Chattanooga and St. Louis Railway branch from Nashville, and Standing Stone (now Monterey). State of Texas Railroad Police Badge made out of a Mexican Coin. Courtesy of Union Pacific Railroad Deputy Chief Randy Lane. Terminal Railroad Police Hat Piece. Gold Terminal Railroad Police Hat Piece. Terminal Railroad Police Detective Badge #333 with State of Missouri seal. 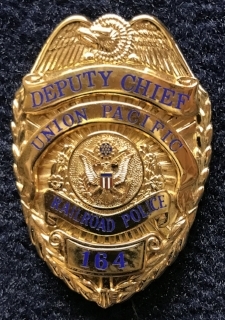 Terminal Railroad Patrolman Badge #15. 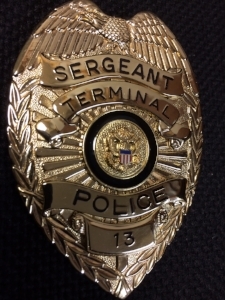 Terminal Railroad Police SergeantBadge #1 with thin blue line covering seal. 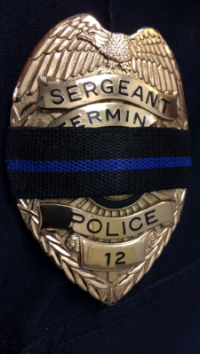 Worn by officers recognizing and officer killed in the line of duty. 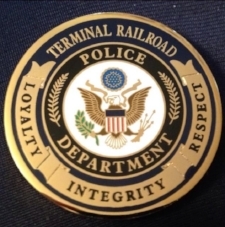 Terminal Railroad Police St. Louis Challenge Coin. 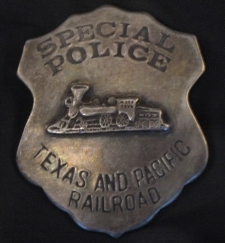 Texas and Pacific Railroad Special Police Badge (replica). 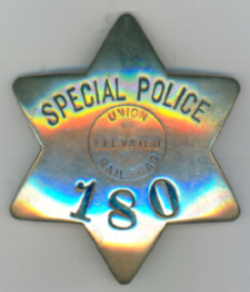 Union Elevated Railroad Special Agent Badge #180 from Chicago. 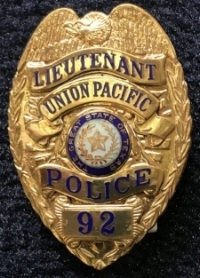 1984, FBI retired as Assistant Director, Washington, D.C.
Union Pacific Police Department challenge coin developed by UP Railroad Special Agent Matthew West and distributed in 2009. In 2012 the Union Pacific Railroad celebrated its' 150th Anniversary. This badge was issued to all working Agents and was only worn during this one year. 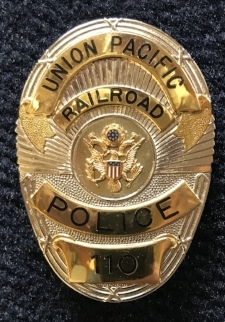 Union Pacific Railroad Police Detective Badge. 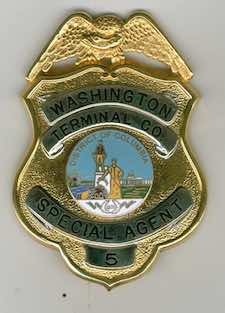 Washington Terminal Railroad Special Agent Badge #5. Wisconsin Central Railroad Special Agent Badge with State of Wisconsin seal. Wisconsin Central Railroad Police Special Agent Badge with state of Illinois seal. 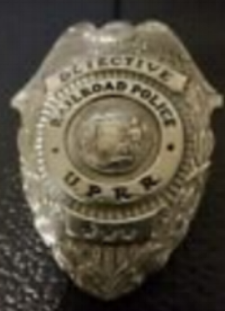 Wiscosin Central LTD Railroad Police Special Agent Badge. Western Australia Railway Police Special Constable cap badge. Australia Railway Police Revenue Protection wallet badge.